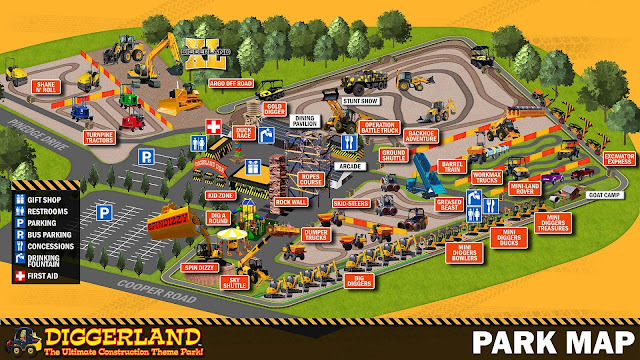 "Diggerland USA is a construction-themed adventure park where children and their families drive, ride and operate heavy machinery in a safe, family-friendly environment. Diggerland is the most unique amusement experience in the world." I'd have to say I totally agree with that. I've never been anyplace quite like Diggerland. The only thing I would add is that it's not just about operating heavy machinery. There are also rides, things to climb on, swings and more! Read on, you'll see. 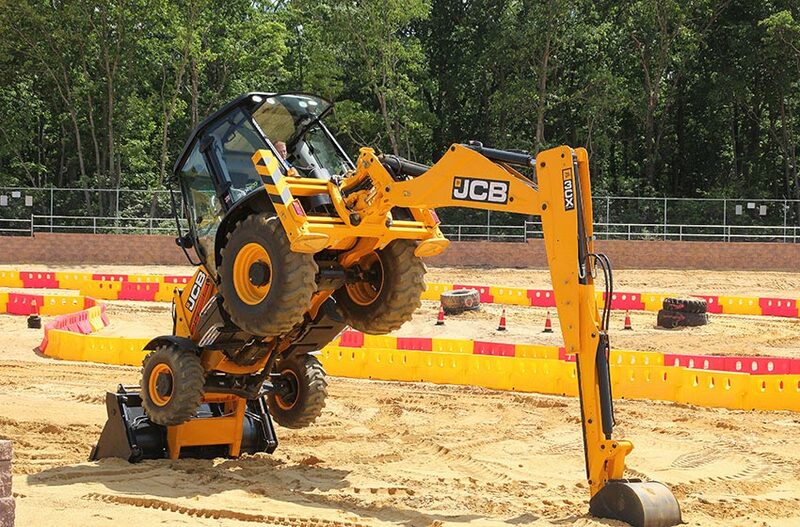 Diggerland USA is located in West Berlin, New Jersey. If you live in New Jersey and you're wondering, 'where is that?' it is in southern New Jersey, off of the Turnpike. It's not far from Philadelphia, and close to towns like Voorhees and one I had never heard of called Evesham (sorry, peeps of Evesham, I don't get down your way too much). There is also a water park called Sahara Sam's Oasis right next door. You can find directions to Diggerland here. I was surprised to see how much this whole area had been built up since the last time I had seen it. There were tons of shops and stores along the way as we drove into Diggerland. We passed a Whole Foods, Trader Joe's, Target, Chick-fil-A, Lowe's... you name it, the store seemed to be down there! So lots of shopping opportunities along the way, too. You can find out all about the local area from the map below. What Age is Diggerland Appropriate For? So once you look at these links, hopefully you can decide what's best for your family. I can tell you quickly that I saw a variety of ages at the park while I was there. Even if a little one couldn't ride a certain ride, there were other things for them to be occupied with. You'll see! Read on. How Much Does Diggerland Cost? 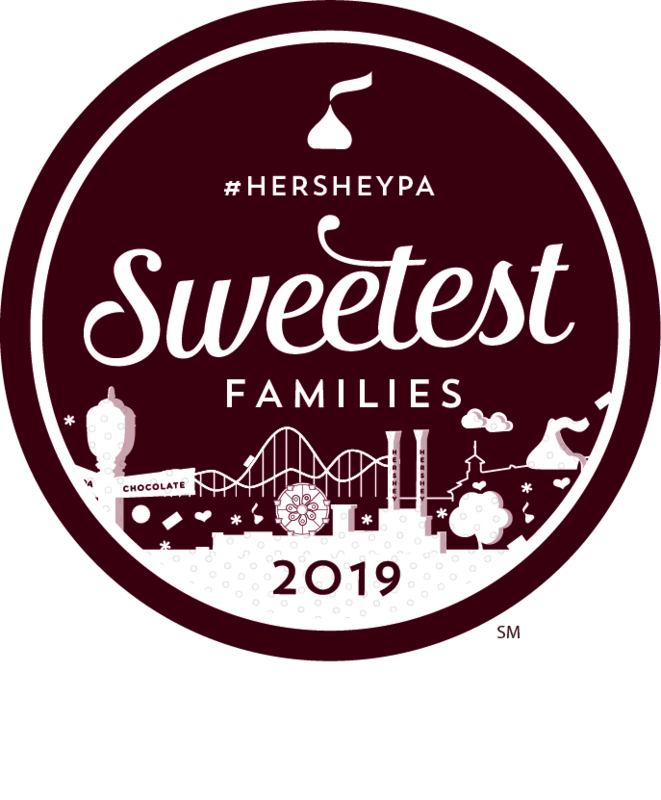 There are a few options for purchasing tickets- you can purchase an 'any day' ticket (you choose to visit any day you like) and there are specific date tickets (you pick an exact date to visit). The any day tickets are $38.95 each and the specific date tickets are $29.95 each (under 42" tall) and $34.95 each (42" tall and over). There is also the option to purchase an annual membership pass, which seriously offers a lot of perks, and it's a really good deal. 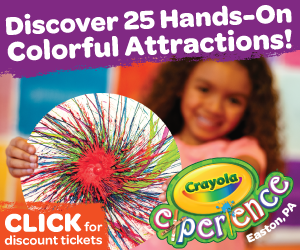 So visit their ticket page for up to date costs, annual member pass info, and info on their special needs nights. I also highly suggest you follow Diggerland on Facebook or Twitter to get the latest coupon codes and deals. How Much is Parking at Diggerland? I love saying this, because I don't get to say it often when writing about theme parks: PARKING IS FREE! Not only that, but because this is a smaller-sized theme park (it sits on roughly 14 acres), the parking lot is adjacent to the park and an easy walk to the entrance. You don't need a shuttle bus or a tram or a complex series of secret underground tunnels to get to and from the park! Gloomy pic, I know, but some rain clouds floated over just as we were leaving! Don't worry, Diggerland stays open rain or shine (except in cases of severe weather). They are open March through December. What Can I Eat at Diggerland? Diggerland USA is one of the few theme parks that actually offered a view of their entire menu online (you can check that out on their Food Options page). I thought that was pretty neat, because I have a picky eater on my hands so I wanted to see what was available before I got there. There are two places to eat at Diggerland. One is a snack-type stand offering hot dogs, fries, ice cream, pretzels, etc. That is called The Munch Box. We ordered pretzels and ice cream there. I have to tell you, the pretzels were totally dried out. I don't know what happened, maybe it was just bad luck on our part and we got a bad batch. Eh, I suppose it happens. Later, we ate at The Lunch Pail (chicken fingers, fries, mozzarella sticks and more ice cream) and it was actually pretty good. Food was fresh there and reasonable priced as far as theme parks go. I also do recommend the souvenir cup for beverages. I didn't think it was worth it at first, but since we wound up getting more than one drink a piece during our all-day visit at the park, it would have been worth it to buy the cup (an average soft drink at the park is about $3.95, even in the soda bottle machines). Outside food is not allowed in the park (with the exception of some items for toddlers, babies, etc.). Both indoor and outdoor picnic tables are available, and there are benches throughout the park, too. The Greased Beast debuted in 2017 at Diggerland USA. Their press site describes it as a ride that "seats guests, not inside the cab, but in the back of a demolition trailer complete with hydraulic systems poised to bring its occupants 34 feet in the air before a simulated 'dump' of its cargo." I was scared to go on it, but I fought through my fear and tried it. I was seated next to a smart young boy in a green t-shirt, who didn't seem the slightest bit frightened. He actually talked me through the whole thing because he 'wasn't scared at all.' I wish I caught his name so I could mention him here, but you know, I was preoccupied with being tipped inside of a truck and everything. The Jersey Momma's Boy and his pal were seated at the very back of the truck, while I was in the middle with Mr. Jersey Momma. I think the scariest seats might be the very back (since the door opens and you can see the ground!) and the very front (near the cab) because you'll be pretty high up in the air. The Greased Beast turned out to be my favorite ride at Diggerland, so that goes to show you not to fear something you haven't tried yet! My second favorite was the Argo, which you can see me waving in if you scroll down below. The Dumper Trucks were fun to drive around. It was neat to see kids driving these machines! Yes, the Spin Dizzy actually spins you around. I had to skip that one because I'm not a spinnin' kind o' gal. But The Jersey Momma's Boy's pal went on it all by himself. He was very brave. The Dig A Round didn't go too fast at all, and it even went backwards. Although the Sky Shuttle looks terrifying, it was actually pretty peaceful (if you don't mind heights), and you got a great view of the whole park. Diggers of all sizes were super cool because you could actually use them (alone or as a lap rider). They came in three different sizes and you could dig or knock down bowling pins! Backhoe Adventures was a favorite of Mr. Jersey Momma. He liked being able to drive a real backhoe around the course. Shake and Roll was another favorite with lap riders. When else will you ever have a chance to drive a little paver like this? So cool, right? They say the stunt show is one of the coolest things to see at Diggerland, but since we were there during their second opening weekend of the spring season, the stunt show was not on that day. If the stunt show is available while you're there, be sure to see it! Diggerland USA has a kids zone for little ones to slide, swing and play, with plenty of benches and picnic tables to sit at. Next to this is the rock climbing wall, which both of the boys I was with chose to skip because they felt like the line was too long. This is something you might want to do when you first arrive, before the park gets too crowded, since you have to wait for each guest to take their turn climbing the wall (more than one guest climbs at a time, on different sides). And beside the rock wall was the ropes course. This was quite intimidating in my opinion, but The Jersey Momma's Boy was determined to try it. I sat below as he climbed to the top with Mr. Jersey Momma. And I mean - all the way to the top (that's him at the top of the picture, holding the safety rope with one hand!). This was a huge accomplishment for The Boy. My heart was full of Momma pride (he was in a safety harness, so I wasn't worried about him getting hurt). He had so much fun and he was so proud of himself, too. Yes! There are goats at Diggerland! They are named Diesel and Dozer and you can even check them out on the Diggerland Goat Cam online. I thought this was totally funny. I love animals so it was so cute to see them hanging out at Diggerland. You can pay 50 cents to get some food for them, and wheel it over to them in a little conveyor belt contraption. The goats seemed to totally love this, and they had a fun area to climb about in at the back of the park. There were no duck races in session since, again, we were visiting at the very start of the Spring season. But normally, you can try out some fun rubber ducky races at Diggerland, or try your hand in panning for gems and minerals. There is a small arcade at Diggerland with crane games, skee ball, air hockey, video games and more. Kids can earn tickets and trade them in for prizes. Games vary in price and kids use a plastic card to swipe and play. There was a machine available where you could recharge your card if needed (although it was not working while we were there so the girl at the counter had to help us). We tried really hard to win one of these cute plush traffic cones but we couldn't earn enough tickets! Oh well. There is also a souvenir shop at Diggerland that you have to walk through on your way out. The shop had tons of construction type toys, construction vests and hats for kids, plush mascots (a dinosaur! ), candy, mugs, cups and more. We got a cute digger mug and some candy for the ride home (don't judge!). Can you believe this was one of my favorite things about Diggerland? I can't even express to you how absolutely nice everyone was who worked here. Pretty much every employee we encountered was friendly, knowledgeable, patient and helpful. I was taking careful note of this kind of thing, because the ride operators had to show each guest how to operate machines. They had to help people on and off rides. They had to assist in hooking up safety equipment (on some rides). Diggerland management should totally give a hats-off to their staff because they were truly awesome. and all of them seemed to love what they were doing. Do you see the face of the guy running this Argo car ride? Ah, so nice to have someone else to drive me around for once! His name was Dominic, I think (sorry to single you out here, Dominic), but can you see the smile on his face? He was like this for every group he rode with! He explained kindly to each person how to drive the Argo. He warned us when the course was going to get bumpy. He double-checked and made sure our safety belts were on correctly. And you can see the look on his face- I think he really likes what he does and it shows. Anyway, just had to point that out. This is what we encountered at pretty much every ride at the park, and it did not go unnoticed or unappreciated. I saw safety checks going on constantly throughout the park. There were always officials walking around and checking rides. The staff operating the rides were very attentive and aware. Since our return from Diggerland, Mr. Jersey Momma has been watching more You Tube videos of it and reading up on its history because he loved it that much. Adults 18 and over can really experience all that Diggerland has to offer by participating in the Diggerland XL program. Book this at Diggerland and you'll get to experience real heavy machinery, and get to do things like crush cars and stuff. Seriously, it's a Dude's (or Dudette's) dream! Check it out here. We saw a few birthday parties going on at Diggerland USA while we were there and we remarked at how much fun they would be. There are different packages available, but some birthday kids had their names announced over the loudspeaker and some even got to wear special Diggerland construction vests. All of the kids involved looked like they were having a blast. Can you imagine a birthday party there? What a blast! Read about their birthday options here. Final Thoughts About Diggerland - Is it Really Worth It? -If there's anything I didn't cover here or you still have questions, you can also check out the Diggerland FAQ page for more help. 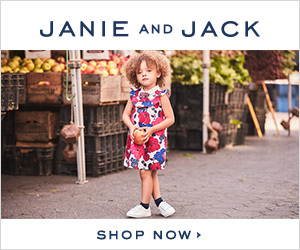 -Wear closed toed shoes or comfy sneakers. This is actually a park requirement. It's not the type of place you wear flip flops or heels to. You'll be climbing in and out of machines, or possibly climbing on a rope course, so you want to have good shoes on. I actually don't think you should ever wear flip flops to a theme park (unless it's a water park), but that's just me! I was once standing behind a flip-flopped teenager at another theme park and there was blood dripping down the back of his heel from a cut he must have received somewhere in the park. Gross! And ouch! So wear shoes!! -Paths are paved and totally fine for strollers. There are plenty of benches and places to sit if you are more of an observer (might be a good option for grandparents or pregnant mommas- many of which I saw walking around!). -Bathrooms were super clean. There was one set of bathrooms near the entrance and another smaller one in the middle of the park, near the Munch Box. The larger bathrooms had a changing table for babies, too. -We visited during the Spring so weather was not too hot. But I can see this being a VERY warm place to be on hot days (paths are asphalt and most rides are in direct sun, although most offer some kind of covering). Wear sunscreen or bring a hat if the weather is supposed to be hot while you're there. I did see fans and water misters located throughout the park, too. -Because some of the rides require safety gear or an explanation on how to work the machines, there is a bit of waiting between each guest's turn. Arrive early to the park if you can and go for the rides that take the longest first. By that I mean the rope climb, or the machines that each person rides individually. Save the rides that move the quickest (like the Operation Battle Truck, Ground Shuttle, DigAround) for last. I mean, you don't have to do that, it's just a suggestion if you're concerned about wait times or lines. Wait times were not bad for us- we waited the longest for the rope course (understandably so). -Consider purchasing the souvenir cup for drinks, as that was a fairly good deal for drinks, especially on a hot day when you'll need refills. -Consider upgrading your ticket to the annual pass if you enjoy Diggerland and think you'll be returning often. Pre-Summer annual pass prices are also super low online! So look into all of that before you go. 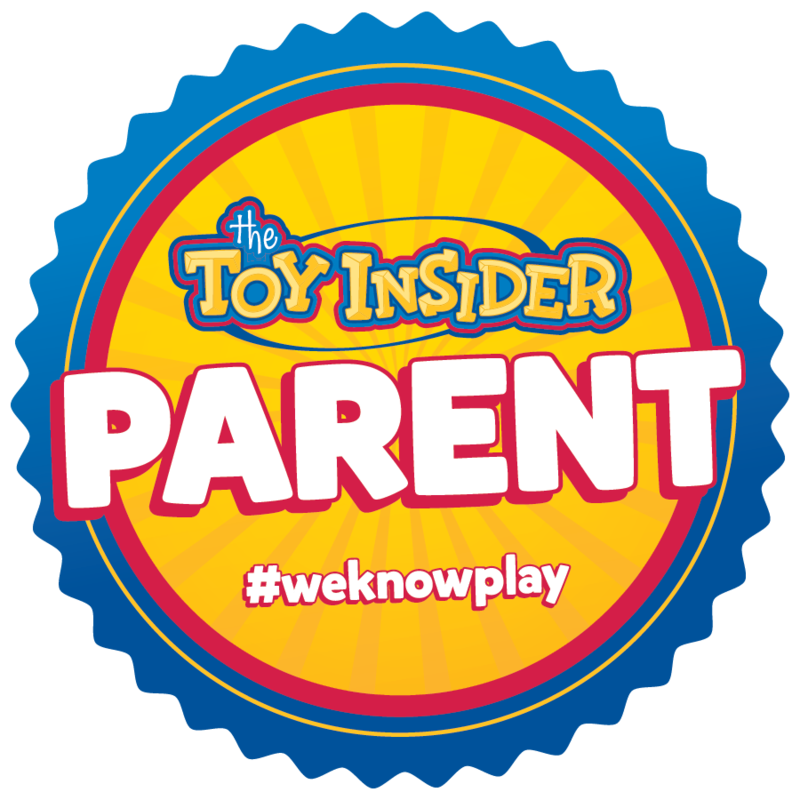 Disclosure: The laws of the Wild West Internet require me to tell you that I received free tickets to Diggerland USA in exchange for an honest review/media coverage. But I say this time and time again- I would not recommend someplace to you that I totally did not love myself. That's not how I roll! All opinions here are my own, and I'm about as honest as you can get. Can you dig it? Ha! See what I did there? Dig? Ah, you get it. It's about time we have a construction theme amusement park. What fun for anyone who likes big trucks and construction. My thoughts exactly, Shelah!! Thanks for reading. Omg!!! This park looks absolutely epic!!!! My daughter would have a blast roaming Diggerland!!!! How about how long do you think you need at the park? All day? Half day? Thanks! Hi Meghan! So if this is your first time visiting I would definitely plan to spend the day. It's a small park but if you want to go on all the rides it does take time to try them all out! When we visited I think we were there from opening till about 4pm or 5pm, but we probably could have stayed to see even more (some rain moved in for us, though, so we called it a day! ).